Registration link for members and non-members. The SDES Black Hills Chapter invites you to join us for this special event to celebrate national Engineers Week. In 1951, the National Society of Professional Engineers founded EWeek to ensure a diverse and well-educated future engineering workforce by increasing understanding of and interest in engineering and technology careers. In 2019, the week of February 17-23 is designated as Engineering Week across the nation. Wildfire is a naturally occurring phenomena; however, changes in land use, climate and human activity have altered historical fire regimes. Improving the resiliency to wildfires depends on 1) understanding wildfire-climate interactions, and 2) how these interactions may change as the climate changes. 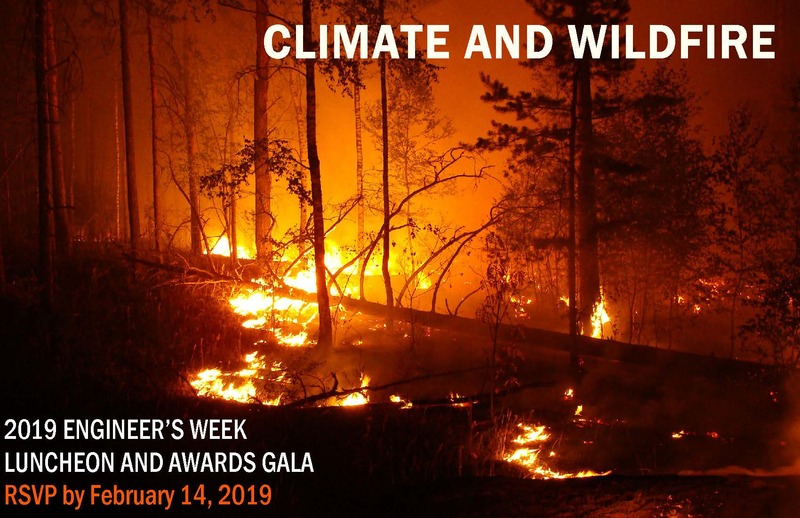 Dr. Clabo's presentation, Climate and Wildfire, will examine historical and current wildfire patterns across the Great Plains, discuss wildfire-climate interactions and explore future climate scenarios across the region and their potential impacts on the local fire regimes. We will also present the chapter awards to honor and recognize the outstanding engineers and projects in our region. Dr. Clabo educates the wildland fire community on the interaction between wildfire and the atmosphere. In addition to State Fire Meteorologist and Research Scientist, he is an incident Meteorologist on one of two Type 2 Rocky Mountain Incident Management Teams. Join us in recognizing the accomplishments of our local engineers as we announce the Black Hills Chapter Engineer of the Year, Young Engineer of the Year and the Outstanding Engineering Achievement/Project of the Year Awards. Please register via this site for the Luncheon and Awards Gala by February 14th so the correct number of attendees can be reported to the Rushmore Plaza Civic Center. Cancellations may be made prior to February 14th, 2019, if needed. After that date, we will not be able to refund your purchase. If you are unable to pay by credit card on-line, please contact Nancy Hoines at sdengineeringsociety@gmail.com for an invoice.